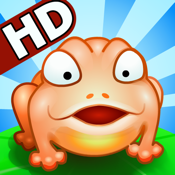 Exactly GOGGLE FROG is a rare game mode of 2-players competition on iPhone/iPod touch! This is our first game which is dedicated to make you play with your COUPLE, FRIENDS, and KIDS on one device. There are some known bugs and we are now fixing them and developing some new characters, scenes and other surprising items for updates coming soon, so get it and keep the positive comments here so we can make the game perfect in next version. How would you do when you haven't eaten any food for 3 days? In this game you and your partner will act as two angry and hungry frogs that are facing to plenty of bugs. Don't hesitate, catching and eating all of them. But, um... Watching out the bomb under your feet and the relative flashing ball on the side, when they touch each other the bomb burst and you lose. So all you guys need to do is that gain the energy by eating more insects and fill the elec-gun full that will shoot lightning out and shock the ball to move to your opponent's side. It has you sticking frogs' tongue out timely and accurately to grab more bugs. - PLAYER mode makes you play with your Kids, Friends, Couple. - COMPUTER mode will take you in a practice time with an AI frog which can enhance your personal skill before you compete to your partner. - Various insects with different looking for you to catch. - Lots of special bugs which have different function in game. - 3 other playable mysterious and magic frogs are waiting for you. - Amazing items just like ice shell, big tongue, combo ball, etc. GOGGLE FROG is absolutely addictive and replayable for player, it's really the MUST HAVE game which is well worth of flapping onto App Store for.